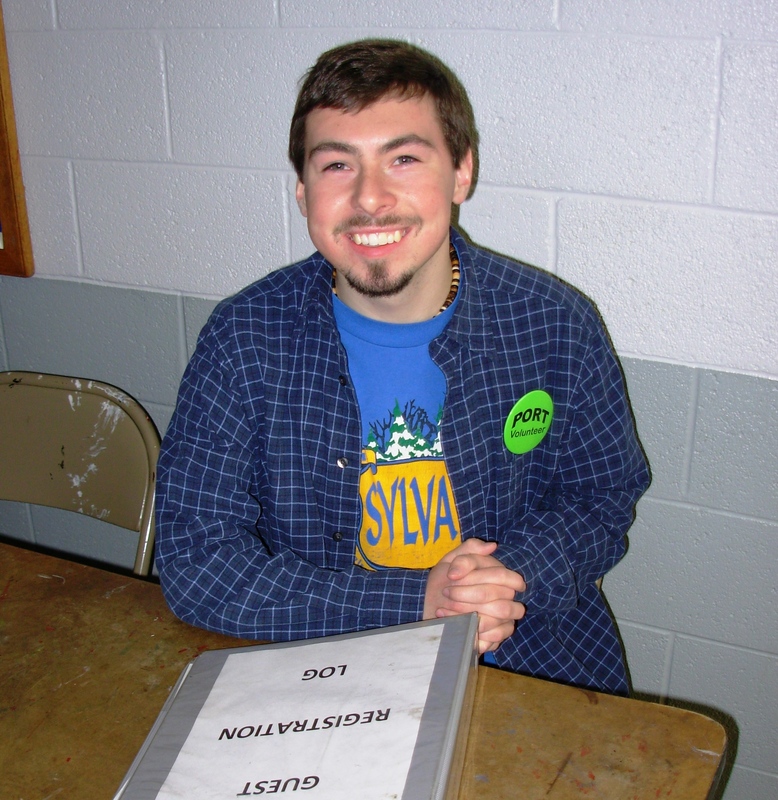 Matt greets guests with a smile at the PORT Shelter, March 2008. Some children face a formidable uphill battle from birth onward, and others are hit with a devastating diagnosis before their teenage years. Lindbergh’s quote, drawn from a book review of one father’s memoir, touches on several aspects of these crises. Her description sounds a bit overwhelming, but if anything, it is an understatement. There is nothing that changes family life more permanently than a child’s chronic serious illness. Yet, as Lindbergh attests, there is something almost superhuman about the way many such children not only survive, but thrive. Sometimes they seem happier than their peers who have no such burdens. Perhaps the focused effort of so many who care — parents, siblings, therapists, educators, doctors, and friends — instills a deep sense of being loved that enables them to endure the physical and psychological pains that are inseparable from being challenged daily with obstacles most of us cannot imagine. Or perhaps they are blessed in unseen ways we will never see or know about. Whatever the reasons for their inspiring psychological stamina and endearing smiles, I hope you are lucky enough to have at least one or two such children — or the adults they grew up to become — in your life. Please don’t assume that their stubbornly cheerful demeanor implies that they are free from loneliness or the need for human caring and everyday friendship. Quite the opposite, in fact. One of the sadder aspects of living with such diagnoses is that, almost inevitably, most of the people in one’s life are paid to be there. While we all are profoundly grateful for those who choose careers in service to others, remember that the doctors, therapists, teachers and families get tired too. More importantly, we all long for connections that exist purely for the sake of relationship, separate and apart from our needs and challenges. Reaching out in friendship to a child or adult with chronic illness and/or disability might feel awkward at first, but you are likely to find them among the most appreciative, understanding and forgiving people you have ever known. If you are experiencing difficult times and dark days, try going where the light shines. It’s sometimes brightest where you least expect it. Carolyn, I had forgotten about that. I do remember how we had to sit in the theater after movies so he could read the credits. You will always be dear to my heart because he was dear to yours! I remember how Phil used to call him “Taz” in those days because his energy level was so high! We think of you often with love and gratitude! Taking time to watch the credits is almost a metaphor for living life at a deeper level, paying more attention to the details in life! For one thing, you appreciate how many people it took to make the movie you just enjoyed! And, once in a while, there is a hidden gem to discover, extra scenes that are full of humor, insight, or surprise! Our family has always been into watching the credits! Good for Matt! Thank you, Linda. Like many kids with varying degrees of autism, Matt has always had areas of high ability, and it used to amaze us how well he picked up on sounds. During those credit-reading years, he would sometimes be watching an animated movie and immediately identify who the voices belonged to, as in “that’s _____ who did the voice of ______ in the movie ________.” Not just the famous ones, either. Apparently Disney uses some of the same, lesser-known voice talents in lots of movies. In any case, there were a few times when I’d take the trouble to check behind him and see if he was right, and he always was, as far as I know. Needless to say, being Matt’s mother has been quite a unique experience. Thanks for your kind words and for seeing through encouraging eyes. Love this photo of Matt. He is always a source of light for me. I miss him and you. Hope all is well. Looking forward to our September date. Julia, my heart goes out to you, today and always. This is beautifully written and profound. So many don’t realize the hard work of caring for a child with disabilities. My son mentioned to me yesterday that it is human nature to avoid what we don’t know, a natural fear probably born from our prehistoric brain. It’s hard for people to reach out to someone that seems different from themselves, yet our whole beings rely on that very connection, the social connection, for comfort and survival. Thank you Alys. I do think that we have lots of encoded RNA/DNA that warns us to avoid what is different, as it can so often mean danger, but less so nowadays than it once did. I also think there’s an element of avoidance of anything we don’t want to deal with in our own lives; we don’t want to be reminded of anything that we fear might happen to us too, or that might make us feel a sense of obligation in our already-overwhelmed lives. Ignorance of the suffering of others can be far more blissful because once we know about their sorrows, we feel an urge to do something to alleviate it. This can be useful if there’s something we really can do, but often, it just leaves us feeling helpless and sad, if we are unable to do anything about it. It’s a hard line for all of us to walk, as we all have gifts to offer but also have limitations. Thanks for understanding! On “avoidance of…anything that might give us a sense of obligation…” Can these arguably cynical thoughts be applied to those in their second childhood (the elderly)? Yes, I think this impulse to “look the other way” can apply to many such situations. I don’t wish to be cynical, but I have heard enough remarks to know it’s a basic human tendency to avoid whatever makes us feel sorrow. I know for sure I’ve often heard people say things such as “I can’t stand visit the nursing home because it makes me feel so sad” (or depressed or guilty or whatever). Another variation is “I’d rather die than be in that situation myself” — though, as Charles Krauthammer has pointed out, we really don’t know how we would feel until we actually find ourselves in such a situation. People who are cared for in institutional settings are seldom there by their own choice, but rather are put there by the decisions — often necessary decisions — of those who otherwise would have to care for them day in and day out. And though we may think those in such settings get frequent visits from loved ones, staff of such facilities have told me otherwise, based on their first hand observations. More heart-rending, some of Matt’s peers have shared their own sorrows with me first hand; here’s an actual recent quote: “I can’t go to my sister’s house for Christmas. They don’t have a bedroom for me.” (This from a weeping forty-something developmentally disabled man whose parents had died the previous year.) Nobody I know enjoys finding out about such real life situations, but that doesn’t mean we don’t need to know. I agree, Julia, to every word. Fear can be one of our greatest protectors and also one of our greatest enemies. Thank you Alys. BTW I am SO enjoying the tea towel you gave me. I was afraid to use it at first, but it washes beautifully and the artwork hasn’t faded so far. I usually use terry cloth, but now that I’ve been using the towel you gave me, I’m thinking of switching over to that type. Though it’s thinner, it seems much more absorbent. I’m delighted to hear, Julia! When you come to California we must visit that store. I know you’ll love it. I heard somewhere that tea towels are good for drying dishes because they don’t give off lint, while the terry towels are nice for drying your hands. I have a few of both and give myself permission to replace them when they start to look tattered. Our local humane society is happy to receive old towels so I save them in a bag for that purpose. What has surprised me most is that I actually prefer the way it feels for drying hands too. I had some linen towels that didn’t absorb well and always felt wet when drying my hands, but the one you gave me is much more absorbent, maybe because it’s thin but with more layers. And definitely better on the lint too. The one you gave me is very soft to the touch and reminds me of the fabric they used to use for cloth diapers. Very gentle on the hands. Yet it took the painted image so well, too. Very nice! Sheila, thanks so much for being a mirror to reflect that light back! Health care professionals tend to have a sort of experience that comes from being on the front lines, so to speak, and it’s often like a form of radar that can be sensed. That young man must have been picking up on your signals. I know you must miss seeing the patients. Thanks for being here with us today! What a smile Matt has, and what a handsome young man. I well remember being taught the difference between sympathy and empathy … we can never really know what someone else is experiencing or has experienced until we experience it, too. Thank you for sharing your thoughts and for helping us try to understand.